The authors have done a first rate job of using contemporary accounts to tell a fasted paced story, supported by a wealth of clear maps and strong illustrations. There is also a very good introduction with a description of the weapons available to both sides. If this is the only book you can buy of the Battle of the Bulge, this is the one to go for. Highly commended. DESCRIPTION: The Allied invasion of Normandy was a huge operation never before attempted on that scale. It was also benefiting from a set of brilliant deception plans that kept the Germans guessing and still believing that the main thrust was to be at Calais. The result was that Allied forces managed to break out of their beach heads and then begin the advance towards Germany. Given the resources available to the Allies, and the ingenious technical solutions developed to support an enormous amphibious landing operation, the Germans had lost the war the moment that the Allies broke out and began their advance. However, the German soldiers continued to fight on and some units achieved local successes, but they were remorselessly forced back towards Germany. As the Allies advanced they were constantly under pressure in logistics supply, making Antwerp a vital port to build supplies for the final advance into Germany. 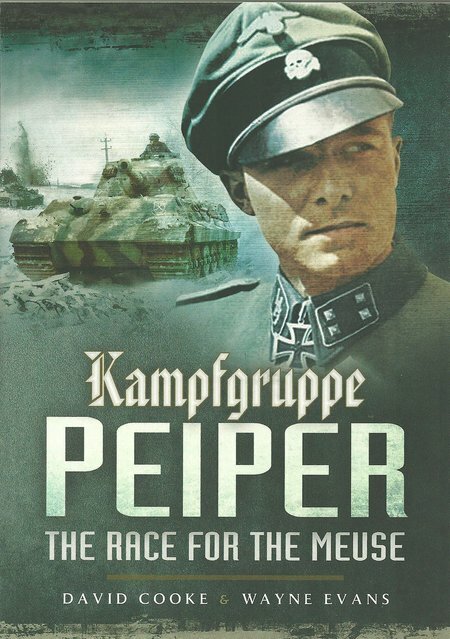 Kampfgruppe Peiper was deployed to take the Meuse Bridges and Antwerp, to deny the Allies the use of Antwerp to supply their forward units as they raced into Holland and Germany. To achieve the objectives, Peiper had to take his heavy tanks through the Ardennes on roads suitable for cars and light trucks, crossing numerous streams on the way. Kampfgruppe Peiper was typical of the Waffen SS. Equipped well, and ruthlessly led, they achieved objectives, often by means of very heavy casualties that would be avoided by other German units. They were also prepared to butcher prisoners to conserve their resources. The Battle of the Bulge came as an unpleasant surprise for the Allies, at a time when weather conditions prevented the tactical air force close support that had made life impossible for German formations. Hitler was throwing everything he had left into one desperate gamble. However, US engineers managed to blow the bridges and their infantry and artillery recovered to fight back. Then the weather improved and the tactical air force was back in business, blitzing any German units that moved. During the battle, Peiper followed type and ordered war crimes. Peiper was part of the Leibstandarte Adolf Hitler that had been responsible for many war crimes on the Eastern Front. He led a powerful armoured fighting gruppe that was equipped with Panther, Tiger and Royal Tiger AFVs. These were formidable tanks in one on one contests with Allied Shermans. The Sherman’s great strength was that it was a balanced design, armour:mobility;firepower, and it was available in considerable numbers. The German tanks had a number of weaknesses, particularly in cross country mobility and survivability against close support rocket and canon-armed fighter aircraft like the Hawker Typhoon. They were also very thirsty and the Germans hoped to seize fuel from over-run Allied positions. As long as Peiper was free of fighter attack and could keep moving, he stood a reasonable chance of punching through the Allied lines, but it is highly debatable that the Germans had the resources to follow up in support of his strike force. As it was, Peiper moved from tenuous advantage to the point where his gruppe was fighting for its life against Allied counter attack and losing.